For serious writers and artists, the iPad Pro and Apple Pencil combination is impossible to beat. But Adonit's stylus wins for backwards compatibility and improved features. 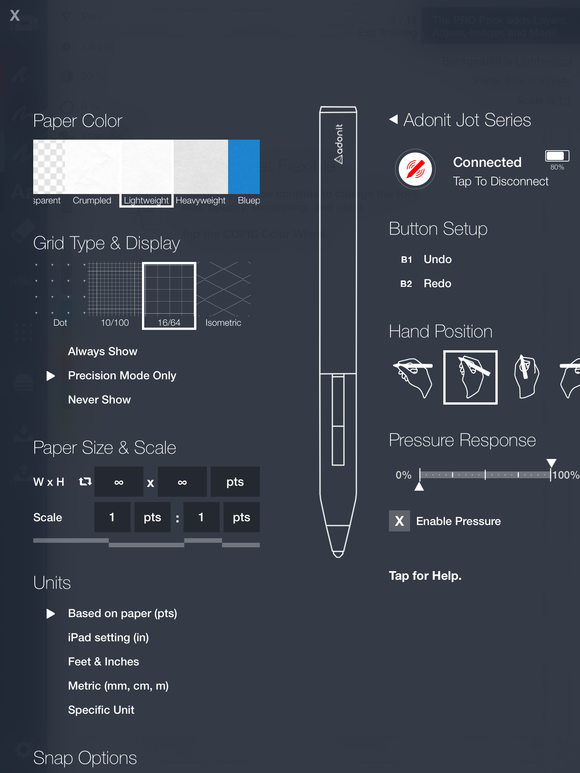 Adonit has been in the stylus game for five years, so when Apple announced it was releasing its own tablet pen last year, I wondered how the company planned to compete. Now Adonit has a new Bluetooth stylus, the $80 Pixel (available on Amazon), which is more accurate and responsive than its older products but still no match for the Apple Pencil. So who might want to buy an Adonit stylus now that Apple has changed the game? Anyone who doesn’t own an iPad Pro. This stylus works with the 12.9-inch iPad Pro, but Apple Pencil reigns supreme. The Pixel’s selling point is compatibility. 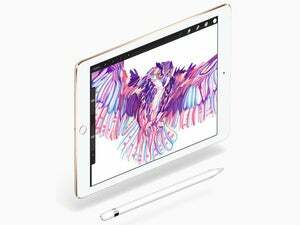 Apple Pencil works with just the 12.9-inch and 9.7-inch iPad Pro models, while the Pixel is compatible with the iPhone 5, 6, 6 Plus, third- and fourth-gen iPads, iPad minis from 1–4, both iPad Air models, and the 12.9-inch iPad Pro. The Pixel doesn’t work with the little Pro just yet. Like the Adonit Jot Script, Dash, and Touch, the Pixel has a 1.9mm Pixelpoint tip instead of a nub or disc, making it easy to draw or sketch in apps that support Adonit products. It has pressure sensitivity, palm rejection, two shortcut buttons, and a grip sensor to detect when you pick it up, so you don’t have to turn it on. It just knows when to come to life. The charging dongle that comes with the Pixel is the exact same as the one that comes with the Script. The end of the pen magnetically snaps into the charger, which you plug into a USB port. 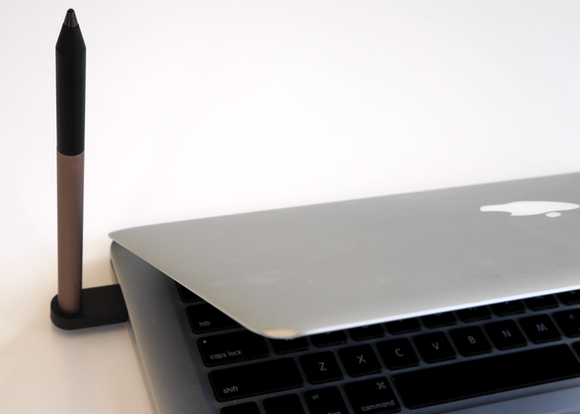 The Adonit charging dongle plugs into a USB port. I tested the Pixel with the iPad Air 1 and the 12.9-inch Pro, and while there were some noticeable differences in Pixel performance between the two devices, this stylus is a huge improvement over Adonit’s older pens. I tested the Pixel in a note-taking app, GoodNotes, and sketching app, Concepts, which were the only supported apps before the stylus’s official launch on Tuesday. Notes Plus, Astropad, Medibang Paint, and Autodesk Sketchbook are expected to integrate the new stylus at launch, and Adobe Sketch, Adobe Draw, and Procreate will support the Pixel soon after launch. On the iPad Pro, using the Pixel in GoodNotes was almost as seamless and easy as the Pencil, though not quite. You can change the writing gesture setting in GoodNotes to optimize the Pixel’s palm rejection, and while I selected the hand position that most resembles my natural writing style, I still had to hold the pen awkwardly if I wanted to write with my hand touching the display. With the Pencil, I can write naturally, with the entire side of my right hand touching the screen, and the result looks and feels like my handwriting on paper does. That’s essential, because I write quickly when I’m taking notes and need a stylus that can keep up. But the Pixel is still a solid pen—at least on the Pro. Don’t expect the same level of performance on older iOS devices. Using the Pixel to draw in Concepts on the first-gen Air, there was a noticeable lag between when I started sketching and when lines appeared onscreen. On the Pro, the Pixel was as responsive as the Pencil, with almost no offset. Adonit marketing manager Rafael Gomez said the Pixel works far better on the iPad Air 2 than the Script or Touch did, and that the new stylus combines the best of both products. Pairing the Pixel to supported apps like Concepts is simple. I’m no artist, so I enlisted the help of IDG graphic designer Erik Swanson, who has experience sketching with a variety of styluses and tablets. Not surprisingly, he preferred the experience of using the Apple Pencil on the Pro, but the Pixel wasn’t far behind. Using the Pixel on the iPad Air, he struggled to make straight lines, even with Concepts’ snap guide turned on. I also compared the Pixel to Adonit’s Jot Script on an iPad Air. The Pixel has improved pressure sensitivity so you can lighten or darken your shading just by altering the stylus’s pressure on the screen. The Pixel also has a sleeker, more traditional pen design with a more precise Pixelpoint tip. Adonit added tip drag to that Pixelpoint tip, so it feels more like writing or drawing on paper than on glass. And it has two shortcut buttons, which neither the Script nor the Apple Pencil have. While the Pixel is thicker and heavier than the Pencil, it’s more pen-like than the Script. 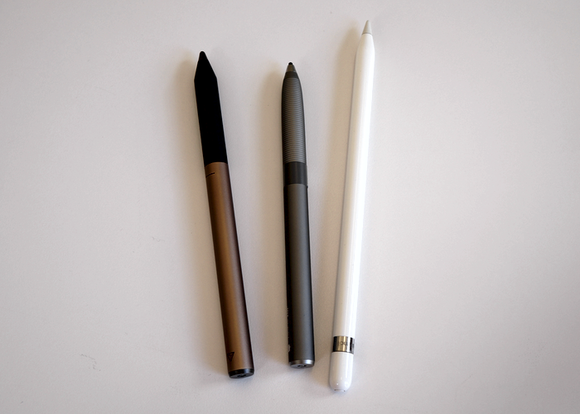 From left to right: the Adonit Pixel, Adonit Script, and Apple Pencil. The Apple Pencil wins, hands down—literally. I like to write with my hand resting on the screen, like I would write on a piece of paper. I can only do that with the Pencil. But take the iPad Pro, and therefore the Pencil, out of the equation, and Adonit’s stylus is a more compelling buy. The Pixel is an affordable pen that packs a ton of features into a sleek, easy-to-use package that’s compatible with a slew of iOS devices. The Pixel’s improved tip is a big upgrade from the Script, thanks to tip drag. I also loved the grip sensor, which meant I could just pick up the pen and start writing (ideally—you may have to pair your Pixel with the app you’re using if the two are disconnected). The Pixel needs more app integration to be as compelling as Adonit’s older styluses, but the company told me it’s working with all the app developers that have been on board in the past to implement Pixel support as soon as possible. And Adonit has pulled off a huge feat in creating a stylus that can be used with so many of Apple’s products, though the iPad Pro’s pen-friendly display is the obvious winner. If you can’t or won’t splurge on a Pro but want a Pencil-like experience, the Adonit Pixel is a winner. Adonit's latest stylus works with many older iOS devices, but it can't compare to the Apple Pencil.